Nails Tip Salon & Spa commissioned Simplio Web Studio to create them . In cooperation with the company, we have come up with this design. The final was no less than sophisticated and straightforward. 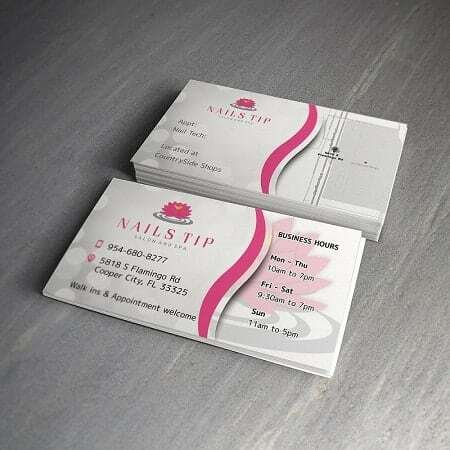 The front design features a very feminine approach using Nails Tip Salon & Spa’s logo as background. It contains the company’s logo, contact details as well as their opening hours. The business card design is just the perfect mix of simplicity and feminity. Nails Tip Salon & Spa commissioned Simplio Web Studio to create them a business card design. In cooperation with the company, we have come up with this design. The final business card design was no less than sophisticated and straightforward.